Superman, the Man of Steel, has a mission: protect the city of Metropolis. Born on another planet, he has super powers here on earth. Using the identity of Clark Kent, reporter for the Daily News newspaper, he conceals his true identity until needed. --From the Genesis Superman instruction manual. �����Superman, The Man of Steel, The Caped Wonder, is regarded as the first true Super Hero. Most scholars refuse to acknowledge SuperCaveMan, whose animated actions were scratched on the walls of the French Lascaux Cave 17,000 years ago, as the first because he wasn�t drawn in color. Also his stories were always the same: he worked as a stone scribe and when somebody needed help, he would change into his costume and appear just in the nick of time to save them. The plot was overused and got stale. Not like Superman stories that always have so much suspense. �����Superman to the rescue! Ta da! (Insert round of applause here). Unlike Superman Comics, in which the Caped Wonder always succeeds, you have a chance to foul up the works and cause the death of numerous innocent people (well really just some computer memory). �����As usual, the game involves fighting bad guys while attempting to stay alive in the process. After playing 25,431 games like this, you would think it would be easy. It isn�t. The pace of play is moderate but the action is deadly. Fun to play and yet still challenging. �����The scenery colors are pastel and there is virtually no texturing. However, the theme music is appealing. That being said, the game action does not depend upon the colors and many might find the coloring a fresh change of pace. 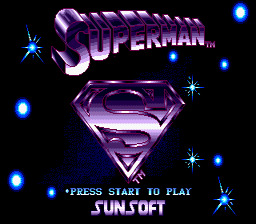 �����Superman the character is well-drawn, with bright attention-getting colors. The enemies also are drawn well and interesting in design. However, their main mode of attack is to simply run into you. Superman�s attacks are simply punches of varying strength. The action sounds of enemies being destroyed might be fine except they are overpowered by the background music. But the attack by Superman sounds like tearing paper. �����1) In Metropolis, children have suddenly started disappearing and you suspect that The Prankster is at the bottom of this evil plot. �����2) Bodies of Metropolis� city employees are found and it appears that Metallo might be attempting to rob the Metropolis City Bank. �����3) And could it truly be? Lois Lane has been kidnapped! Only Brainaic could be involved in such a dastardly crime. �����And to make matters worse, Superman must contend with the criminal genius, Mr. Mxyzptlk throughout his three endeavors. Man that really ticks me off! �����You must first get the Blue Shield for Hyper Spin. There will be a sign on the screen where it can be used. After spinning downward, you must pick up a Red Shield to again be able to use the Sonic Punch. Used to drill down into the Earth. �����These depend upon whether he is in a flying stage or a ground stage. When flying he uses his Heat Vision and when on the ground he uses his Sonic Punch. However, he can use the Heat Vision continually, but it might not be very effective. His Super Power will automatically recharge after being used. So if necessary, hang loose until it is completely charged. Disclaimer: This information is provided from the manual. Anything not covered was not in the manual. You are on your own kids, now place nice.